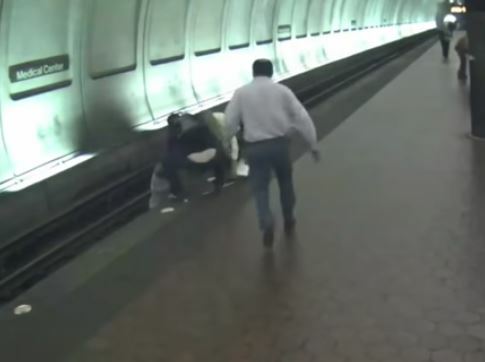 Strangers selflessly saved a visually impaired man from being hit by an oncoming train after he fell onto tracks at a metro station. 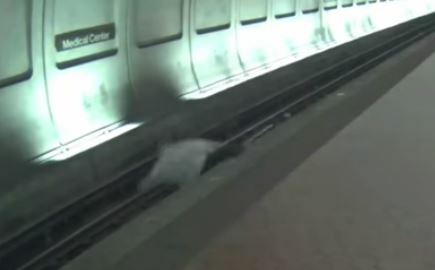 The unidentified man fell onto the tracks at the Medical Center Station in Bethseda, Maryland, around 8am on Tuesday (April 9) while attempting to navigate his way around the platform using his cane. Getting closer and closer to the ledge, the man suddenly fell onto the rails with a train bound for Glenmont heading his way. 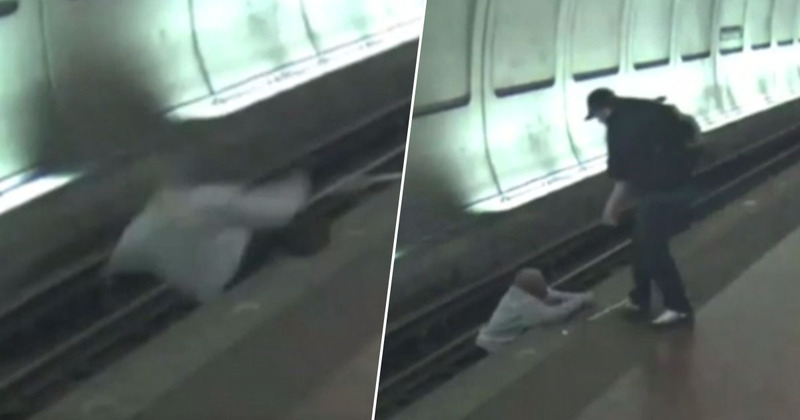 The frightening incident was captured by security cameras, later being shared by the Washington Metropolitan Area Transit Authority. Three people can be seen rushing over to the man, pulling him up from the tracks with around 20 seconds to spare. 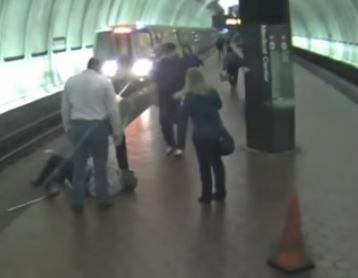 Footage shows the man lying on his back on the platform, gripping onto his cane as the passengers dial 911. According to WJLA, the man complained of shortness of breath and pain in his left arm, being transported straight to hospital suffering no life-threatening injuries. 22-year-old Brendan Cawley was commuting to his job at Union Kitchen when he spotted the man, running over the help. I just knew it was something that I needed to do. He was around six feet tall and weighed more than 300 pounds. I couldn’t do it alone. As two other men, both dressed in business clothes, rushed to his side, Cawley told them ‘we need to get him up now’ and they did, pulling him back up to the platform. Due to the urgency of the situation, Cawley was unable to get the man’s name but hopes one day to reconnect. I have thought a little bit about if I wasn’t there, and to be honest, I’m not exactly sure how the outcome would have been. I’m just glad I was. That’s my faith in humanity restored! The actions of Cawley and the other passengers have been praised by many on social media. Another examples of ordinary citizens in this great land who are extraordinary heroes. Another examples of ordinary citizens in this great land who are extraordinary heros. I’m so glad someone jumped in and helped him. I hope he’s doing okay. 🙏🙏I’m so glad someone jumped in and helped him. I hope he’s doing okay. Do you have any update on how he’s doing? And people were standing around and didn’t help the man beforehand! It is understood the man is recovering well.